So Mania's finally out, the game by the fans, for the fans. This game's built on the Retro Engine, just like the 1, 2, and CD ports. However, unlike those games, Mania has a ton of improvements, features built with the PC platform in mind, and new content. Along with that, it's a new entry to the "classic style" series of games. It's the first time we have a legitimate full game, a new experience in the series, styled after the Genesis originals, SINCE the originals. And we have incentive to mod it. ~90% of files extracted thanks to TPot. Sprites are not the raw files; TPot converted them from their originals using the level palettes. Some files are missing, as his extraction method requires rsdkv5_extract to work, which requires some tedious work in finding filenames etc. Likely the tool doesn't work 100% yet either. Currently, there isn't a clear-cut method of extracting data from the game. RSDK, or RetroSDK, is the file format used for the game. The format was cracked by Glitch for Sonic CD, however the RSDK format has been updated, so while that build doesn't work, a new version's in the works. It's not exactly user friendly however, and requires you to enter the filename of the item you want (which can go wrong easily if you don't know what you're looking for), so be warned. Another partial extraction method, using "sonic-retrun," works as demonstrated by Qjimbo. It seems all the images are corrupt and only 5 of the OGG music tracks expanded. The RSDK format isn't yet fully understood, so no file replacement / packing is possible at this time. This post will be updated as information comes up. There have been sprite swaps by Beatz, accomplished by editing the main executable. This is, as you may guess, the string indexes the game reads to load the sprite .bin files for the main characters. This can lead to some funny happenings. Here I replaced everyone with Sonic, and doing so created a Sonic-with-Tails'-Tails abomination, along with giving insight on how Mania's sprite system works. In the second image, you can see that Sonic, or rather Knuckles, gliding uses a sprite that, when queued by the game, uses Sonic's peelout animation. From the looks of things, it's likely the Retro Engine calls for sprites indexed in an order for the 3's special moves, and the only sprites that match flight and gliding are Sonic's peelout animation. The same likely happens if Knuckles/Tails replace Sonic and they attempt the Peel Out maneuver. interestingly, if a sprite isn't available in a bin's index, the game actually doesn't load anything and the character turns blank. This doesn't crash the game; as long as the game can load the character's .bin file, there's no issue. Interesting thing about this is that it seems collision, to an extent, is tied to the .bin file as well in some way. Either this object has very small collision, or it has none, in which case the game doesn't know what to do with it and it just clips through the floor. However, this is promising, as its sprites were able to be loaded outside its base stage... with some side effects. Looks like Retro Engine still uses palettes. 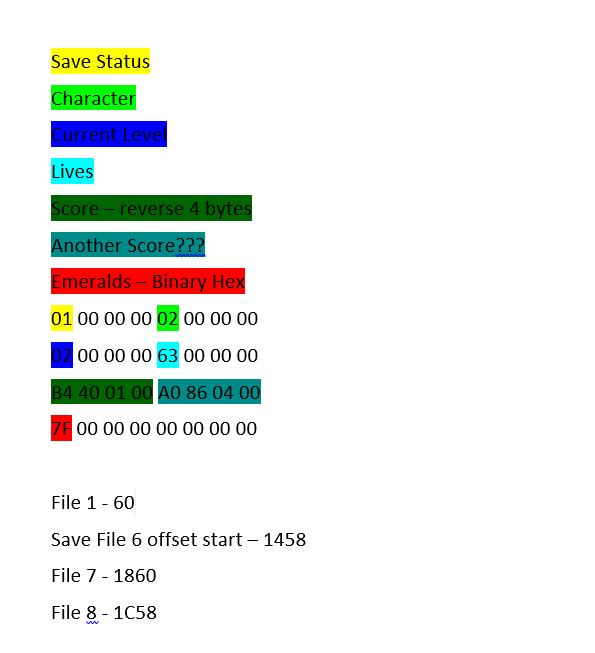 Work has been done on the save file format by codenamegamma. I'll link to his forum post, and quote what he's found here since he explains his findings better than I possibly could. When I was messing around with other save files from the Taxman series. I found this...only information on it. surprisingly the save file format stays the same, it just gets modded for each game. like Sonic 1 and 2 on Android. On Sonic Mania the big difference is that instead of a 32kb save file, it's not 64kb. so twice the size for what I can tell no reason. here is a map I made to illustrate how a Save Game Slot is arranged. The slot numbers are backwards as well. in game, they go from Right to Left 7, 6, 5, 4, 3, 2, 1 instead of like Sonic CD or the Android ports just regular 1, 2 ,3, 4.
here are some values of interest so I don't lose them and for anyone else who wants to make edits to their savefiles. Offset 2520 = # of Total Medals. in the medal listing above you can change a 01 to a 02 to make it a gold medal but it wont show up in game. it wont be till you complete a bonus stage that that other 2 offsets update and then it will be reflected in game. Below the Medal listings is a bunch of 01, that toggle and tell the game if you completed a certain Special Stage. I'm not sure what links to what so id follow the pattern if you plan on filling out the rest of your medals. Save Status - 00 is a save file thats NOT in use. and 01 is one that is currently being played. 02 is one that is "Cleared" so you can select any level regardless if you have been there or not. if you do set it to 01, then the save file will care about the Level offset "1460" 00 - Green Hill, 01 - Chem Plant, 04 - Studiopolis Zone and so on. Character - Builds are 00 - 04, being Sonic & Tails, Soinc Alone, Tails alone, Knuckles Alone. though i might be wrong about that. Emerald count. is binary as explained in the other thread. 0 1 1 1 1 1 1 1 Tells the game what emeralds you have. all of them is 7F and none is 00. if you want to customize you can use windows calculator to come up with a binary equivilant in hex. just make sure its set to Programmer mode and you have it in Binary, then leave the first bit blank. the first bit HAS to be zero. then you can press 1 or 0 to till you get the other 7 you want and under Hex it will say the correct value to edit in. The Score Values, are the same as Soinc CD and i assume other games. the 4 bytes you see are reversed so to find that correct value, just go into calculator again and type the bits out, starting with the last and working forward. that will give you the correct value. i plan to hopefully write a save game editor soon, but it might take a while, the Sonic CD one i wrote works and i learned a lot so hopefully i can apply it here. In codenamegamma's post, he also outlines how character loading can be forced, to legitimately have 2 sonics, 2 tails,' and... well 2 knuckles is already a thing, though other partner combinations like knuckles + sonic/tails and tails + sonic are possible through this method. 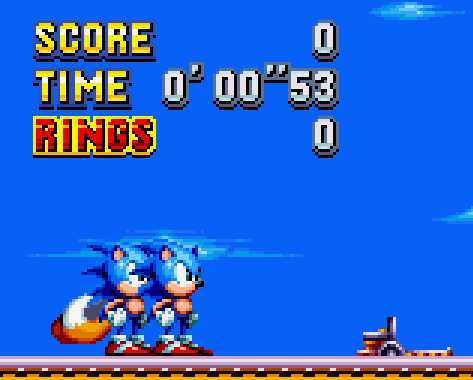 Here I started a game with Sonic and Tails and then changed the characters to Tails and Sonic. surprisingly the game doesn't crash. 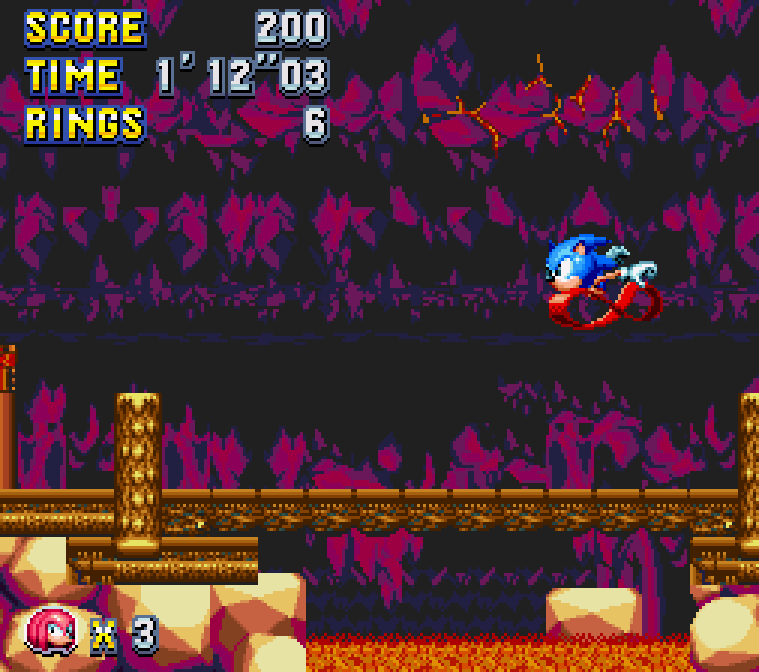 it's very funny seeing sonic use his super peel out sprites for flying. it also works with if you wanna force Tails into both player slots. the only thing that didn't work when starting up a regular 2 player game is Knuckles forcing him into sonic or tails just crashes the game. however, in & Knuckles mode it might be possible to replace one of the knuckles with any character you want. Maybe an existing member of this community who just so happened to make this game possible can come in and tell us how to break open his own creation. I'm really excited to see the mods for this game. It'll probably take a while, but still, it'll be great to see. Stealth mentioned on his stream that Sonic Mania runs on Retro Engine version 5. 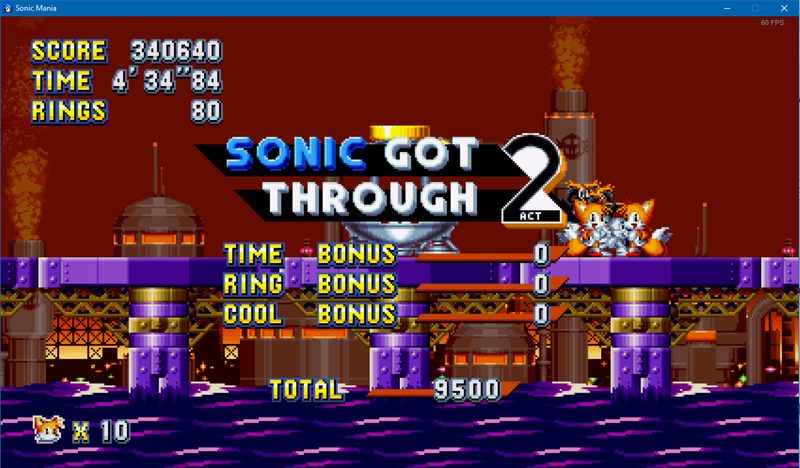 As a frame of reference, Sonic CD ran on version 3 while Sonic 1 and 2 ran on version 4. I'm assuming Retro Sonic was version 1 and 2. 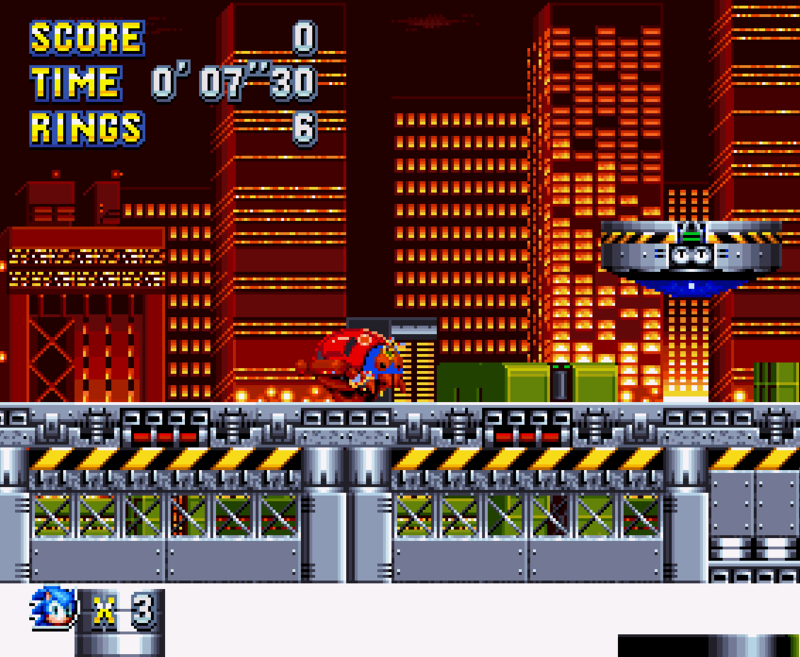 Stealth also mentioned that a lot of things had to be rebuilt for version 5, so preexisting gimmicks from Sonic 1 and 2 for example could not just be reused. It's possible that RSDK extractor no longer works due to the updates. While I'm here though, mod wishlist (this isn't a list of demands or anything, it's just for fun. Don't shoot me powers at be)! Would be very interesting if mods happened for this but I haven't really seen anything for Sonic CD be really released or submitted to the Hacking Contest. Someone sound the Lone Devil alarm. Right? And now he has some new sprites to play with. Oh and how could I forget. I'm hoping someone figures out some kinda netplay setup with this for some 2P fun. I've just heard somewhere that the game uses Denuvo DRM (I believe this link is the proof). I'm not too familiar with this, what will this mean for possible Sonic Mania mods? So Mania's finally out, the game by the fans, for the fans. Unlike 1 and 2, which were bound to iOS systems, this game's available on all PC platforms, and *isn't* a lesser-understood version of the game compared to what the community is used to. While Tax's ports were objectively better quality in terms of performance, aspect ratio, and content, the modding community had no reason to dig into those games outside of revealing hidden content. 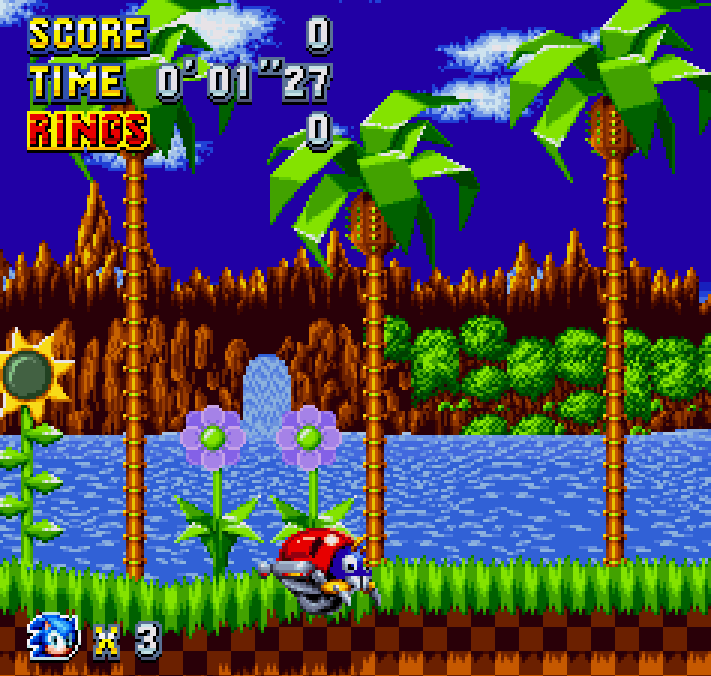 With CD, while the game was on PC, it was still simply a PC port of Sonic CD which has already been modded in the past and documented well, even porting over the Sonic 2 spindash much like Tax did in the official re-release. Considering the quality of the port, there was also no reason to dig into it if you could just load CD in Kega/Gens/etc and get a similar experience, better in some ways worse in others. This time, there's a legitimate incentive to mod the game. I'm not the best with cracking esoteric formats but I'll at least be able to compile information as it comes into this topic for reader's convenience. Currently, all that I personally know is that the game stores data in .RSDK format. This, presumably "RetroSDK" format, does already have a topic on extraction, however from my testing the old unpacker doesn't seem to work; when trying to unpack the game data, the program returns "invalid name length." it's likely Tax updated his formats, meaning some updating is required for the program. Along with that, it's been stated that an issue with the previous program has been recompiling to a propper .rsdk format to then be read by the game, though that's likely outdated info and I apologize if that's the case. Still, extraction, once it becomes known, should be relatively simple by comparison; recompiling may be a serious problem depending on how Tax's format has self-check methods, or even if there's a form of MD5 recognition or similar within the executable's code. Wouldn't put it past him, but that'd be a pain to deal with :E (it also wouldn't seem to be that patch-friendly, so I'm not sure he'd be that extreme, though considering the small weight of the game it's not that unlikely). Chimera is it possible for you guys to do backwards compatible modding like adding the drop dash or getting Knuckles as a playable character in Sonic CD? You can all stop before you start - this is not a topic for "OMG MOD ME THIS INTO MANIA PLOX". However it seems all the images are corrupt and only 5 of the OGG music tracks expanded. Not sure if there is another approach (not super familiar with the current status of RSDK extraction). Edit: Vector Harbor over at ffshrine used Xripper (http://www.zeus-soft...wnloads/xripper) to extract all the OGG music files from the archive. Obviously doesn't help much for modding since you can't re-pack it, but still neat. I recall someone mentioning a few weeks back in the Mania Spoilers topic that Sonic CD 2011 modding had some interesting/exciting things going on behind the scenes. I'd imagine/hope they'll be able to apply these "Things" to Mania, whatever they may be. Anyone know anything about that, or was it just hot air? Seriously though, we could try requesting an official mod loader and modding tools as a future update. Many PC games have it, and Sega did add support for ROM hacks for the Steam versions of the classic games a while back, so chances are they would be willing to add it if people requested it. Not that official support would be necessary for a Mania modding scene to surface, but it would probably speed up its development. The problem with a mod loader is that such a thing would be opening a whole can of worms I don't think SEGA's prepared for. The ROM hacking scene made a plethora of obvious, excellent content that SEGA could either ignore or use as part of a marketing shtick that would get their arcade thing more attention, so it made a bit of sense, I spose, for them to allow loading hacks of their games that people purchased, as a bit of "spice" to games that, outside of re-release licences, have pretty much become abandonware. The thing to understand is that those Genesis games are OLD. Like not just "beginning of the series" old, more "you were paying $60 for this thing" old. Mania isn't in the same category; it's a new sonic game that was released mostly last week and, on the platform we want to mod it on, today. I wouldn't doubt if, in SEGA's eyes, greenlighting Mania was an incredibly bold and risky move; in many ways it was, but it paid off and was legitimately great of them to do, but it was still bold. They're a company in a culture that usually distances themselves from mods (hello nintendo). Giving a neat way to load mods that *already exist* is one thing; a mod loader to their most recent, most anticipated game is pushing it. So seems what we have to wait for now is an advancement off the RSDK format's understanding, which, if Stealth saying some stuff had to be worked from the ground up is true, could mean even tweaks to the extractor's source could yield negative. Ah well, it's how it's gotta be I guess. You have to register an account to see the links, I won't repost them here due to the rules.